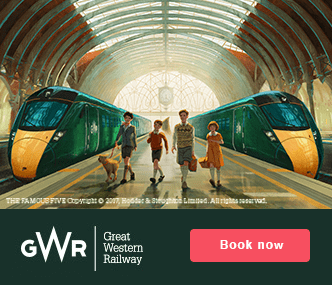 GWR is the lead travel sponsor of Visit Cornwall, who through financial and in-kind support facilitate Visit Cornwall’s ambitious destination marketing plans. Working collaboratively on promoting destination Cornwall, and the accessibility of train travel to and around the region, the partnership brings two like-minded organisations together. Once in Cornwall, there's a great rail network for getting around the county, ideal for when the roads are busy in the summer. Give the driver a rest and grab a cheap day return to St Ives or Looe. Sit back and enjoy the scenery on the Tamar Valley Line or head to the beach at Newquay or Falmouth. For more info, go to Great Scenic Railways. The First Group co-ordinate rail and bus services from stations. For bus link details telephone 08457 484950. Park-and-ride schemes run in season at Liskeard (for Looe) and Lelant Saltings (for St. Ives). It takes less than five hours to get from London to the heart of Cornwall by either train or car. 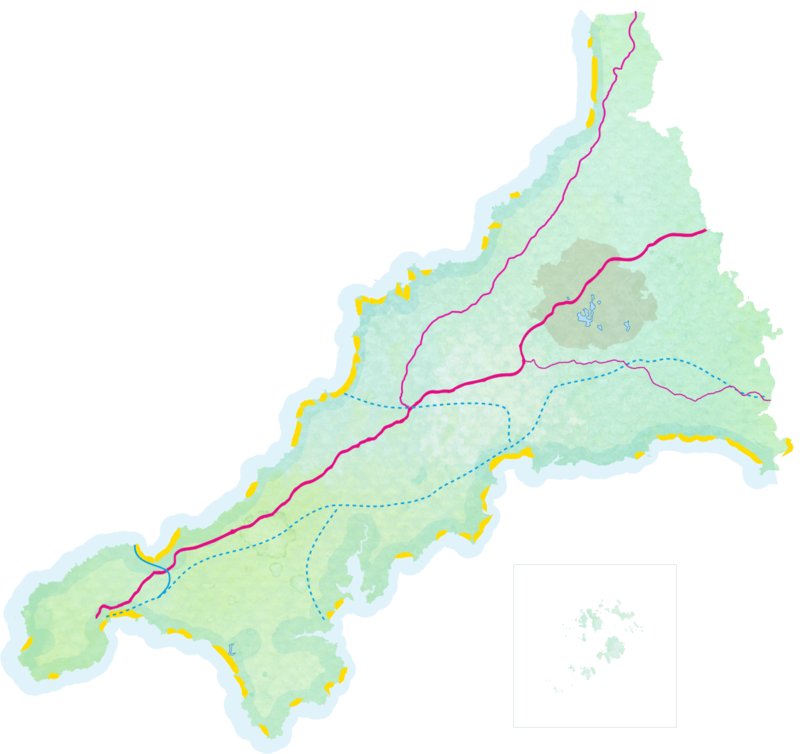 Drive along the M4 motorway from London, or M6 from Manchester, and then the M5 to Exeter and finally either the A30, that is mostly dual carriageway, or the A38 through Plymouth and Saltash into South East Cornwall. Alternatively if you enter Cornwall from North Devon, there is the scenic Atlantic Highway A39 through Bude which you can join from Junction 27 on the M5. Due to the high volume of traffic on Cornwall's roads during the summer months the main routes can become congested especially at weekends. Travelling overnight or outside peak rush hours is recommended to avoid long delays. National Express operate a full service into Cornwall as far as Penzance, Megabus also go to a few towns including Newquay and Falmouth. Many tour operators offer coach holidays to Cornwall, contact your local travel agent for details. For information on public transport, including local bus timetables, once you are in Cornwall. Click here. You can fly to Cornwall from airports around the UK, Ireland, Germany, Denmark, Portugal and Spain. Cornwall Airport Newquay currently has year round flights from London Heathrow, Manchester, Dublin, Alicante, Leeds-Bradford and Southend Airport, with additional routes in the summer season from Aberdeen, Belfast, Birmingham, Doncaster-Sheffield, Edinburgh, Liverpool, Glasgow, and Newcastle (Flybe); Cork (Aer Lingus); Faro (Ryanair); Stuttgart and Dusseldorf (Eurowings); and Copenhagen (SAS). Passenger assistance service and accessibility for reduced mobility; disabled access (step-free), parking and toilets, wheelchairs and Aviramp. Car parking close to the terminal, the airport offers 30 minutes free parking. Cornish gift shop located in departures offering a great selection of Cornish wine and spirits as well as other local food and souvenir products. Enjoy the comforts of ‘The Lounge’ and relax in style with sofa style seating and peace and quiet. The Lounge is a private room within departures where guests can enjoy complimentary refreshments; tea/coffee, alcoholic /soft drinks and snacks. Entry can be booked on the day at the airport Information Desk. Official onsite taxi service available with Coastline Travel Cornwall. Taxis can be booked in advance or on arrival. A team of highly trained and friendly staff to help you through your Airport journey. Travelling across the Channel from France to the UK can take as little time as 35 minutes on the Eurotunnel from Calais to Folkestone and just 1 hour and 20 minutes on one of the ferry services between France and Dover. Plymouth is the closest ferry port to Cornwall, being just across the River Tamar. Brittany Ferries offer services from Roscoff in France and Santander in Northern Spain into Plymouth as well as further services from France and Spain into Portsmouth and Poole. If you would like to see your business listed on this page, please email industry@visitcornwall.com.